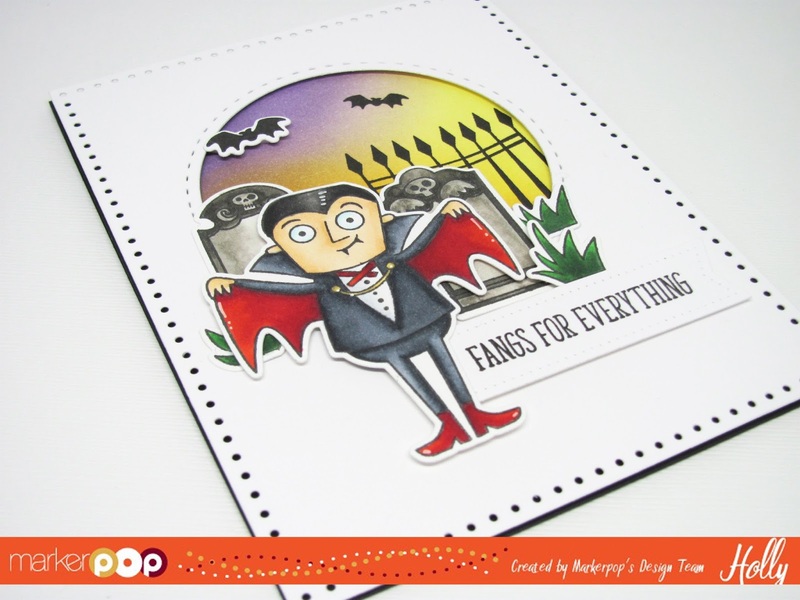 Hollybeary Creations : Fangs for everything!! Halloween is just around the corner and I'm loving all the fun Halloween and Fall sets that have been released this year. It makes it really hard to pick a Favorite! 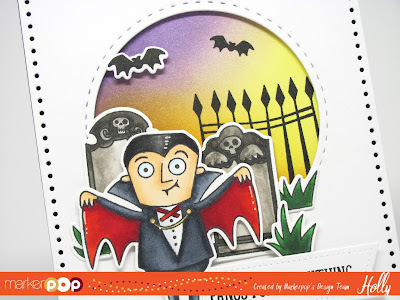 Today I'm using the My Favorite Things Frightful Friends and Grave Situation stamp sets. I started out by cutting two pieces of Neenah Solar White cardstock to 4 1/4 x 5 1/2. Then I die cut one panel using the Pizzaz Pieces Creative Cuts die set from Mama Elephant. I lined the die cut panel up with the other panel and made some pencils marks inside the circle window. Then using some Distress inks in Squeezed Lemonade, Dusty Concord and Spiced Marmalade I created a background for the window opening. 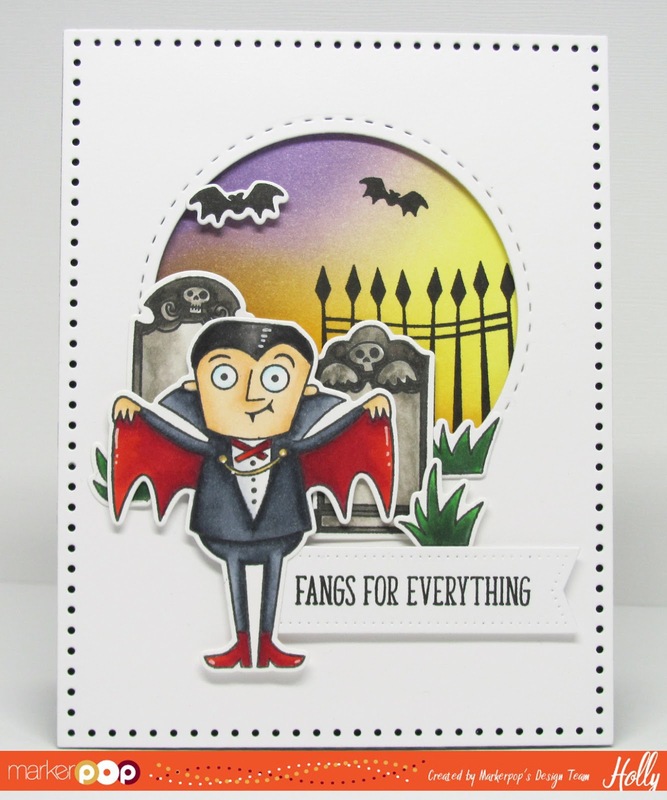 Once the Distress inks were dry I stamped the Fence and Bat images from the Frightful Friends set using some VersaFine Onyx Black ink. I added some Foam tape to the back of the window panel and adhered it over the Distressed panel. Then I adhered both panels to a Black top folding card base. I stamped the Vampire, Bat and Grass images from Frightful Friends and the Gravestones from Grave Situation sets onto some White cardstock using Memento Tuxedo Black ink and colored them in with Copics. Then I die cut them using the coordinating die sets and my Big Shot. I adhered them with liquid glue and foam tape. I stamped the sentiment from Frightful Friends onto a piece of White cardstock in VersaFine Onyx Black ink and die cut it using the Avery Elle Pierced Banners Die set. Then I adhered it just behind the Vampire image with some additional Foam tape. I wanted a little extra highlight so I added some white with a White Gel Pen. Super Cute!! Vampire: (Cap & Boots) R29, R17, R39, Y23, Y28 (Shirt) C1,C00 (eyes) B00,B000 (Suit) C8,C6, C4, C1 (Skin) E000, E00,E51, E53 (Hair)T8, T6, T5,T3 (Grave Stones) W0,W2,W4,W6, W8 (Grass) YG09,G07,G28.